At Dragonfly Farm we grow flowers. We grow them to use in our floral arrangements and to sell at our seasonal farm stand and flower shop. We grow some fruit and vegetables, and we raise chickens and ducks to help around the farm. We grow everything organically and fairly sustainably. The ducks wander the farm and eat the slugs, snails and some bugs. 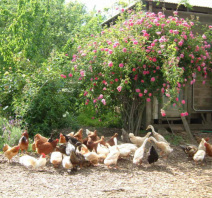 The chickens lay eggs to keep our team fed and their manure is used to make our garden grow. There are also a number of cats wandering around, they keep us happy and keep down the rodent populations. There is a lot of work to do and EVERYONE does their part. If you hang around long enough, we might just put you to work too. Please feel free to come wander around the garden, whether we are open or not. Bring a picnic and enjoy our picnic area, or a blanket and a book to relax in the willow circle. We encourage you to bring your easel, camera, or whatever you like to capture the beauty of the different seasons at the farm. The critters all love visitors.